The eLearning format puts you in the driver’s seat. No schedule conflicts or attending a class, no assignment due in a week. You set the pace and manage the training. This training format gives you 24/7 access, provides consist learning and knowledge to all employees to ensure quality assurance on information that is key to your organization. We can customize any of our eLearning products with your company’s unique brand, logo and messaging. So much to learn, but so little time? Do you know the risk exposure of your applicant tracking system. Is your online recruiting system accessible to all people? Are your reporting numbers lacking with your disability candidate pool? Do you know the real difference between accessibility and accommodation? What you don’t know about recruitment of persons with disabilities will hurt you! How much money are you leaving on the table? Do you have high turnover? How much of your money are you allowing the IRS to take? If potentially 10% of your new hire employees would qualify for a tax credit worth up to $9600 per employee, wouldn’t you want to know about it? Learn how to increase your cash flow with this easy step by step process provided in this course. Are you new to Web Accessibility Development? Are you currently being questioned about not having an accessible website. Do you know the accessibility development guidelines and standards? Are you frustrated because you can’t find the information that you need? This eLearning Course has been created to provide developers with quick access to the information they need to understand the basics of Web Accessibility Design. Do you know the Federal and State regulations around the important accessibility issues? Do you know how accessibility can and will affect your business? Are you aware of the global accessibility laws currently in place? Find out the facts of why accessibility is critical to your business in regard to revenue, outreach and global markets. This bundle combines the Web Accessibility Design and Accessibility: The Facts eLearning courses. Buy both and save! This package includes the Web and IT Accessibility 101 Starter Tool Kit eBook with both of the Web Accessibility Design and Accessibility: The Facts eLearning courses. You will have every training modality needed to understand and fix a basic accessibility coding problem. Stay Turned for More eLearning. 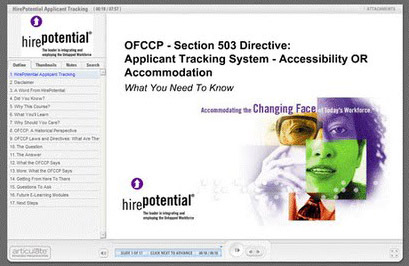 Coming Soon – The Interactive Accommodation Process and Implementation,- Disability Etiquette and Awareness, – For Recruiters: Recruiting and Interviewing People with Disabilities – For Recruiters: Out REACH and Compliance Starter Kit – For Managers: Interviewing and Managing People with Disabilities – Assistive Technology: Basic and Most Commonly Used – A Business Model: The Inclusion of People with Disabilities in Corporations.